Outstanding spaghetti and meatballs at North Italia in El Segundo! Also had their excellent appetizer known as “Zucca Chips”. Zucchini sliced paper thin and fried. So good! My new favorite appetizer at The Par Lounge has to be their Crispy Green Beans! Made with an onion batter and served with a super tasty chipotle buttermilk dressing. Simply outstanding! Outstanding happy hour appetizers at The Par Lounge! Tater skins, fried chicken tenders, etc. The only thing missing is their excellent calamari. The new loaded boneless wings at Chili’s are outstanding! They are smothered in a white queso, 3-cheese blend, applewood smoked bacon & chopped green onions. Served with a side of house made ranch dressing. I usually prefer my chicken on a bone but these were outrageous good! Best part was not feeling like I had to take a shower after eating it! Outstanding dinner recently at The Par Lounge. Here’s the “Combo Platter” from the appetizer menu. 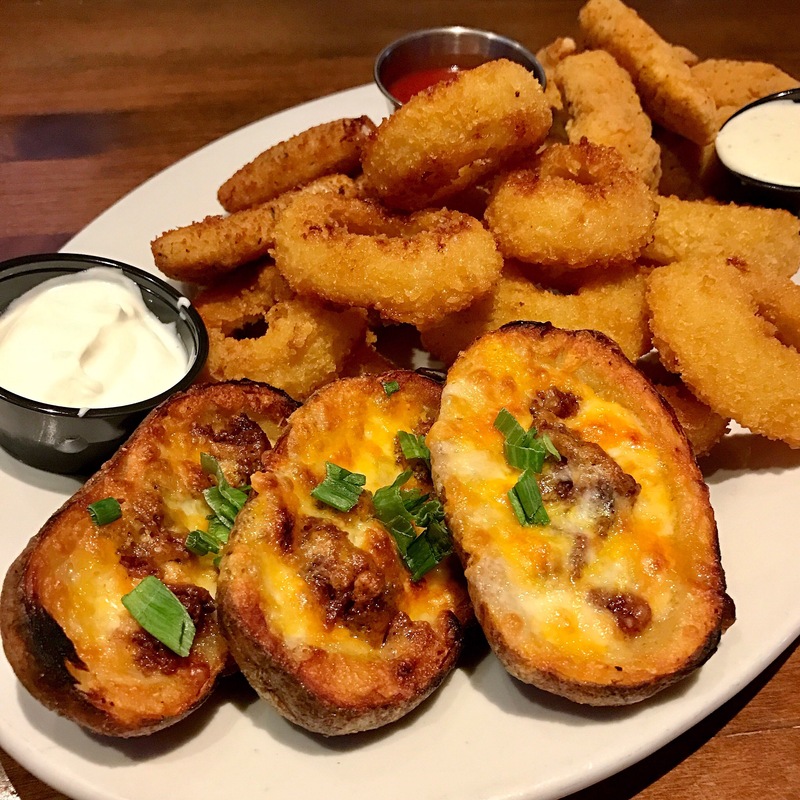 It includes tater skins, fried mozzarella, onion rings and chicken tenders. Served with sides of ranch dressing, warm marinara and sour cream. Comes with three skins which were great, crispy and hot with an ample amount of cheese. Could have used more bacon and green onions though. The fried cheese was a fairly conservative portion, but excellent nonetheless. Triangle shapes that yielded a perfect cheese pull. There was a very liberal amount of onion rings which is fine with me. For frozen, institutional rings, these are some of the best in town. Five crispy chicken tenders rounded it all out. Now obviously this is a sea of fried brown goodness and not something you want to eat everyday! Occasionally though it’s a nice treat. The only other restaurant I eat at with this much brown on one plate would be Cracker Barrel. Good thing for my pants size there’s none close by. This whole platter is plenty for two hungry adults, or two average adults with picky child. 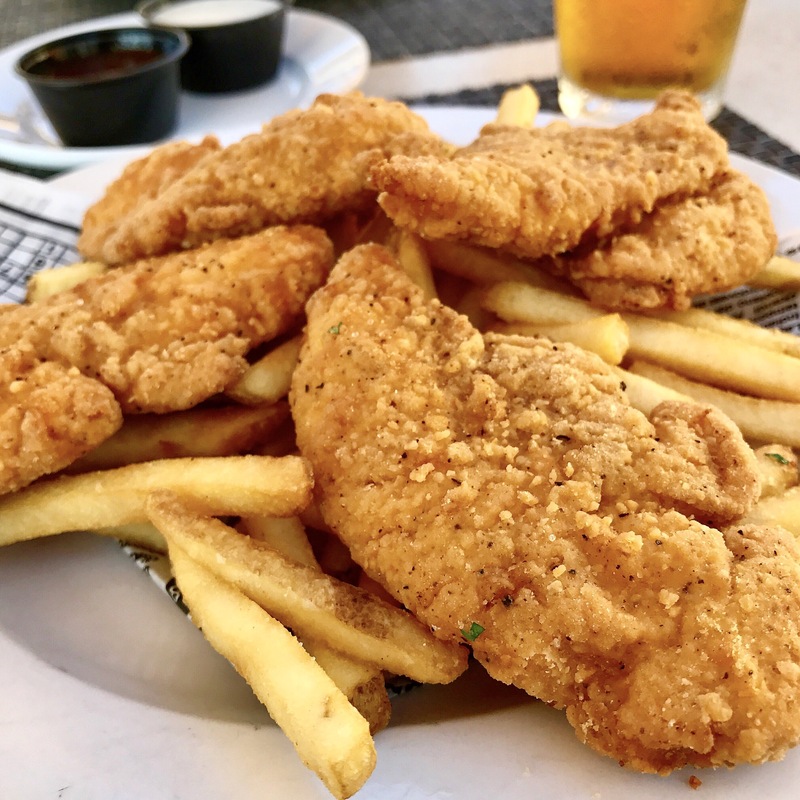 Best chicken tender appetizer in town is at The Par Lounge, that I can tell you! Likely frozen and off the Sysco truck, it’s still a high quality, fried chicken tender. Coupled with their hot, crispy fries, it’s a meal in itself. Pairs perfectly with ranch dressing, BBQ sauce and a draft IPA. 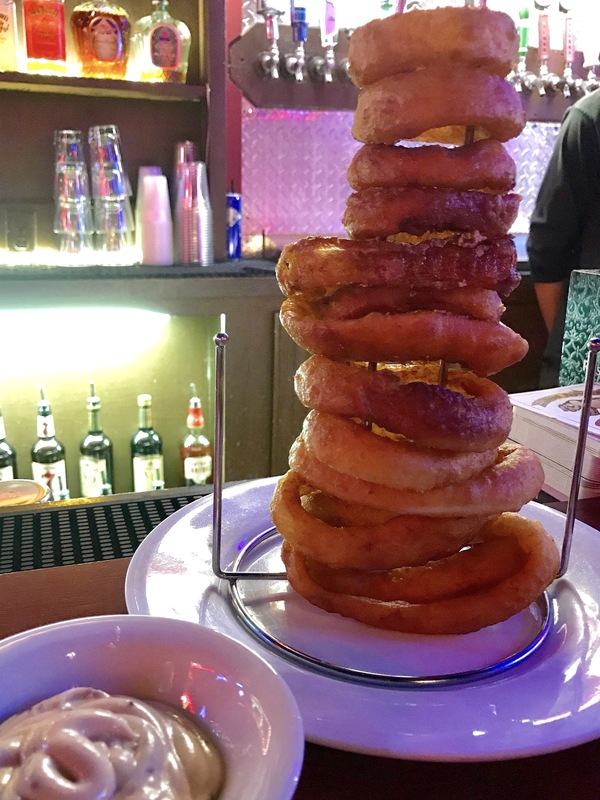 Way Point Saloon has the most impressive onion ring tower I’ve encountered! What stands out for me is how hot & crispy they come out of the kitchen coupled with an outstanding fry sauce. The rings here are beer battered and definitely in the top two of Ramona when it comes to onion rings. 23 draft beers on tap is a pretty good draw too!